The Shelby International Registry identifies this car as Number 6 of the original 16 1966 Ford Mustangs purchased by Carroll Shelby. These 16 cars underwent Shelby modifications to prepare them for Group II competition. Number 6 was originally purchased from Shelby American by Gofaster, Inc. of Long Island City, N.Y. Gofaster, Inc., owned by John Norwood, was the East Coast Distributor for Goodyear racing tires at the time. The Car was entered by the Ring Free Oil Racing Team in the 1967 24 Hour Daytona Continental. Ray Cuomo of Gofaster along with co-driver Paul Richards brought the car home 1st in Class and 11th Overall in this prestigious international endurance race. Unlike many of her sister cars, which competed during the 1967 and 1968 seasons, #6 did not return to competition until 1969 when John Gimbel traded Ray Cuomo of Gofaster his 1967 Shelby GT350 for Car #6, a car trailer and for a tow car a 1963 blue Oldsmobile station wagon, nicknamed "The Blue Whale". John used the car for his Drivers Schools, Regional, National and finally his FIA driver license requirements. In 1970 the car was entered again in the 24 Hours of Daytona by Ray Cuomo Racing Enterprises with John Gimbel and George (Corky) Lisberg as drivers. They finished the car 2nd in Class and 16th Overall. 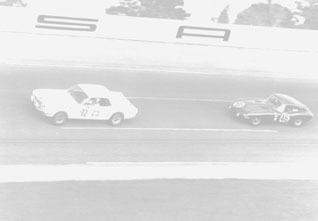 Jan Nelson and Frank Dobias purchased the car from John Gimbel in March of 1970. Their first TransAm event was the 1970 Schaeffer TransAm at Lime Rock Park. Jan and Frank ran the car in numerous East Coast TransAm events from St. Jovite Canada to Mid-Ohio during 1970, '71, '72 and '73 as well as EMRA, SCCA Regional and National races thru the 1970s'. The cars best finish in a TransAm event was 16th in the 1972 Schaeffer TransAm at Lime Rock. Frank had used the car for his SCCA Regional and FIA licenses. In 1971 Jan and Frank finished the car 5th in Class in the Summit Point IMSA Camel GT race. The cars last race was an EMRA endurance race at Bryar Motorsport Park in Louden, NH in 1980. The car sat for the next 22 years. During a televised Barrett-Jackson auction in 2002 Frank saw the 1967 Jerry Titus Notchback come up to the auction block. The broadcasters commented on the rarity of the 1966, '67 and '68 Shelby Notchbacks. Frank contacted Howard Pardee of the Shelby American Automobile Club (SAAC) who verified the fact that they did indeed have one of these rare cars. They decided to restore the car to its original appearance and specifications as first raced in the 1967 24 Hour Daytona Continental. The car was accepted by the Historic TransAm Group, made up of current owners of original cars that ran the TransAm Series from 1966 thru 1972. Jan and Frank finished their 4 year restoration project of Car #6 in June of 2006. The restored car made it first appearance at the 2006 Shelby American Automobile Club National Convention (SAAC-31) at Virginia International Raceway. The 2006 Rolex Vintage Festival at Lime Rock Park was the first vintage event for the car. Car #6 began its vintage history just as it began its racing history - A Winner! The car won the "Rolex Best In Show" award at this prestigious vintage event. Car #6 also won the BMW Award for "Best Presentation and Performance" in the TransAm category. This was quite an honor as the Historic TransAm Group brought over 30 original TransAm cars to the event celebrating the 40th Anniversary of the TransAm Series. In 2007 Car #6 was invited to and was displayed at the Daytona Rolex 24 Heritage Exhibition during the 2007 Rolex 24 week. Donald Farr, editor of the publication, Mustang Monthly came to Daytona for an interview and photo shoot for an article which appeared in the June 2007 issue of the magazine. Remarkably the 2007 Daytona Heritage Exhibition was the 40th Anniversary of the cars Class Win in the 24 Hour race.